Institutions for climate finance and the new Green Climate Fund were the two main topics of discussion at the workshop on Climate Finance held in Abu Dhabi last week, hosted at the NYU Abu Dhabi campus by the Global Climate Finance Project, together with the UAE’s Ministry of Foreign Affairs. This was the Project’s third workshop in the UAE. The workshop started on Monday, January 9th, bringing local UAE government officials together with an impressive group of experts drawing from academia, the World Bank, various NGOs and the private sector. The workshop heard from three panels discussing the global architecture; the new Green Climate Fund; and tracking climate finance flows. Discussion was so lively that the second day began with a panel originally intended to be on the first day: making transformative investments in climate technologies. The rest of the day was devoted to discussing a paper that will form the opening chapters of a new book on institutions for climate finance that the workshop participants will contribute to. Over the two days, participants engaged in a comprehensive discussion, identifying a number of pressing issues for resolution, areas in which further research is required, and various opportunities for both the UAE and the global community more broadly, to build an effective regime for climate finance. 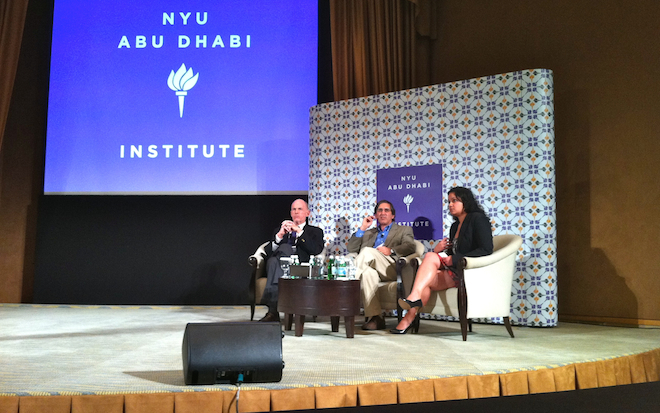 After the first day of the workshop, Professor Richard Stewart, Professor Daniel Bodansky of Arizona State University and Smita Nakhooda of the Overseas Development Institute held a public discussion on “The Future of International Climate Action,” as a part of the public lectures hosted by NYU Abu Dhabi. The lecture was well attended and was followed by a spirited question and answer session and reception.